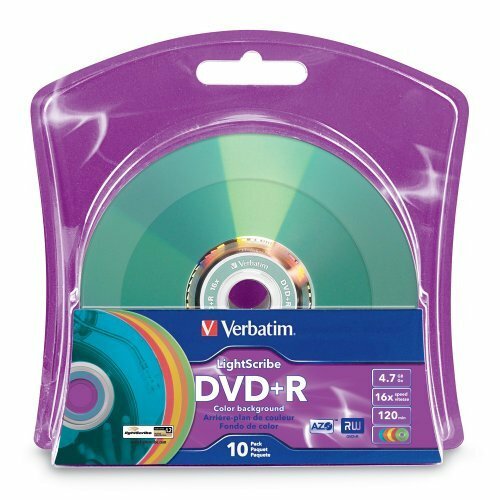 LightScribe Direct Disc Labeling technology lets you burn labels onto the disc with your LightScribe DVD writer. No more need for a printer, just flip the disc over, reinsert it in the drive, and burn the label. Enjoy professional-looking results: laser precision and detail means no more marker scrawl or labels to center. Write disc contents right on the surface of the disc or personalize the disc with your favorite picture. Use for business presentations, home movies, or any other special project. High storage capacity accommodates two hours of DVD-quality video at standard resolution. Permanent, write-once format prevents accidental overwrites and erasures. Requires LightScribe enabled drive.